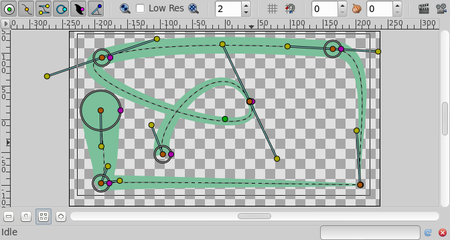 Outline Layers are use to hold strokes or edges of filled shapes. 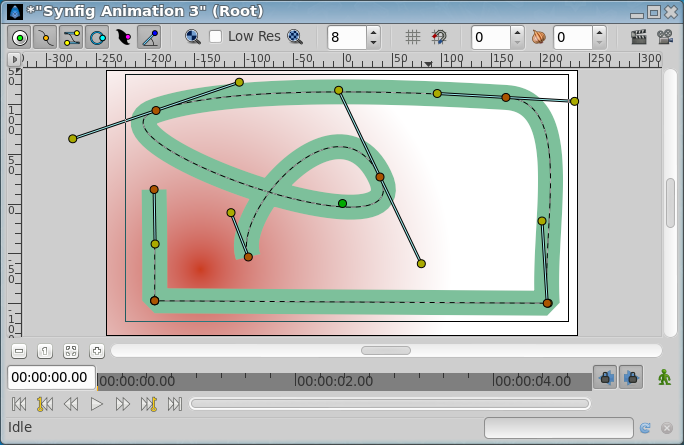 They give a cartoon look to an animation when added to be the edge of the filled shapes. Also standalone Outlines (strokes) are used to define fold of 3D drawings and used together with shadows (created using gradients or feathering) are the basis of an artist's work. To create an Outline Layer use the Spline Tool and check "Create Outline" in the Tool Options Panel. Once you finish the definition of the geometry of your outline and after pressing the "Make Spline" button (or selecting another tool or state) you create the Outline Layer with the current "Outline Color". 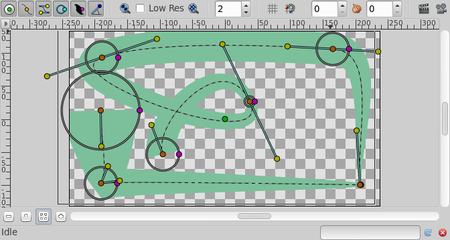 Depending on the options you choose in the Tool Options Panel other Tools like Star Tool or Circle Tool can also create Outline Layers. The first 11 parameters of the Outline are common parameter that are shared for several types of Layers. Click on the links to see their definitions. Only the particular parameters for the Outline Layer are described here. 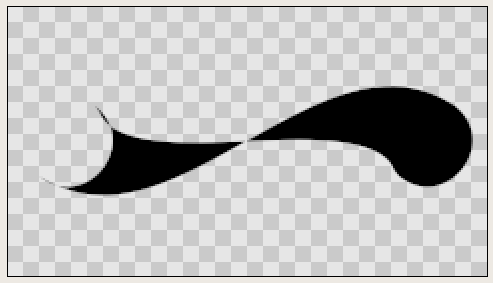 The Outline width parameter is a float value in pixels that represents the basic value of the width for all the points of the curve at the same time. It works together with the width parameter of the vertices' child values. So setting the "Outline Width" to 1.0px then the resulting value for the rendered width in that vertex comes from this formula: W = OLW * VW + 2E. W = resulting width of the outline at that vertex. OLW = overall parameter for the width of all the vertices (that is the Outline Width parameter). VW = specific vertex width value. E = value of the Expand parameter. The width handle would show the radius value for that vertex (W/2). Starting image After doubling the value of "Outline Width"
The "Expand" parameter is similar to the "Outline Width" parameter, but rather than being multiplied by each vertex's width, it is added to the radius of each vertex. In other words (2*Expand) is added to the diameter of each vertex. No "Sharp Cusps" With "Sharp Cusps"
no "Rounded Begin" "Rounded Begin"
Nota : With cairo render activated, if quality superior to 6, enabling "Rounded Begin" enable also R"Rounded End". 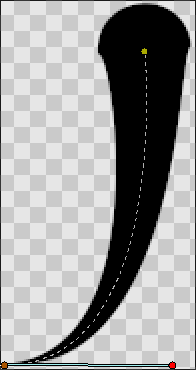 No "Rounded End" With "Rounded End"
Nota : With cairo render activated, if quality superior to 6, enabling "Rounded End" enable also "Rounded Begin". This parameter currently does absolutely nothing at all! 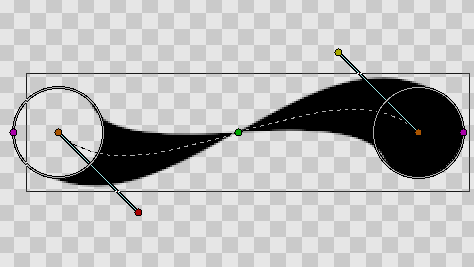 When 'Homogeneous' isn't checked, the width is interpolated linearly with the spline's 't' parameter. When 'Homogeneous' is checked, the width is interpolated linearly with the spline's length. This page was last modified on 26 February 2017, at 07:15.